A well-designed gating system is a perquisite for achieving perfect casting. The key objective of a gating system is to ensure smooth and complete flow of molten metal from ladle to the casting cavity. i) Horizontal systems- Suitable for flat castings filled under gravity and commonly used in sand casting of ferrous metals and gravity die casting of non-ferrous metals. ii) Vertical systems- Suitable for tall castings and used in high pressure sand and shell mold and die casting processes. iii) Top gating systems- wherein the molten metal enters at the top of the casting promoting directional solidification from bottom to top of the casting. v) Middle gating systems- these combine the features of top and bottom systems.disturbances. The number and position of ingate(s) is very important in designing the gating systems. The diagram given below describes the different considerations in the channel layout in horizontal gating system with side ingates. 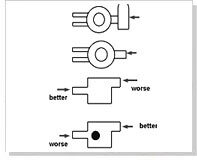 i) Side feeders- When side feeders are used their efficiency can be improved by filling the first stream of hot molten metal through ingates, thereby reducing the fettling effort and subsequent marks on the casting. ii) Thick sections - This allows molten metal to flow to other sections with minimal cooling reducing breakage during fettling of ingates. ii) Tiii) Clear path - In case of sand casting it is essential to allow the metal to flow with minimal obstructions or direction changes to curb turbulence. In such systems ingates should never be placed opposite to a core. iv) Low free fall - here the ingates are located where the free fall of molten metal in the mold cavity is low thereby minimizing oxidation and erosion at the point of impact. i) Flow distance - It must minimize the total flow distance with the gating channel to give maximum yield and minimum heat loss. iii) Mold layout - It should be positioned to minimize the size of the bounding box, which encloses the entire casting. Hick sections- This allows molten metal to flow to other sections with minimal cooling reducing breakage during fettling of ingates. 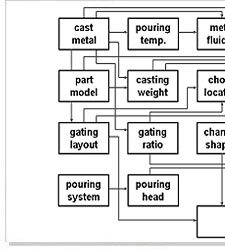 Where tf is the casting time, W is the weight in kg, t is the section thickness in mm and Lf is the fluidity length in mm, whereas K0, Kf , Ks , Kt , Kw are all coefficients. The value of these coefficients can be set to achieve a perfect metal-process combination in specific castings. A gating system is designed to fill the casting in prescribed time keeping a constant level of liquid metal in the basin to achieve a controlled flow rate via the choke, a small cross section in system that regulates the flow rate. 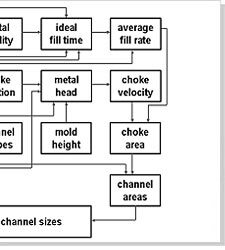 i) Sprue - It is a circular cross-section minimizing turbulence and heat loss and its area is quantified from choke area and gating ratio. Ideally it should be large at top and small at bottom. ii) Sprue well : It is designed to restrict the free fall of molten metal by directing it in a right angle towards the runner. It aids in reducing turbulence and air aspiration. Ideally it should be shaped cylindrically having diameter twice as that of sprue exit and depth twice of runner. iii) Runner - Mainly slows down the molten metal that speeds during the free fall from sprue to the ingate. The cross section are of a runner should be greater than the sprue exit. It should also be able to fill completely before allowing the metal to enter the ingates. In systems where more than one ingate is present, it is recommended that the runner cross section area must be lowered after each ingate connection to ensure smooth flow. 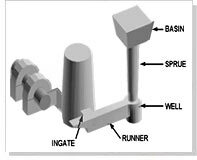 iv) Ingate : It directs the molten metal from the gating system to the mold cavity. It is recommended that ingate should be designed to reduce the metal velocity; they must be easy to fettle, must not lead to a hot spot and the flow of molten metal from the ingate should be proportional to the volume of casting region. v) Fettling - The ingate size must be small in comparison to the connected part of casting to avoid breakage and cracks. i) Shop floor trials - Samples are produced using the actual materials and process that would be finally employed. These are observed for surface, sub-surface and internal quality and destructive and non-destructive testing methods. ii) High-speed radiography - The mold filling phenomenon is recorded using a high speed x-ray camera and observed of any defects. iii) Open mold - In this a portion of cope above casting cavity is cut and a flow of molten metal stream form ingate and gradual filling of the mold is recorded using a video camera. iv) Contact wire sensing - In this contact wires are placed in different parts of the mold and when the metal touches a particular wire, the metal flow gets recorded by a multichannel recorder. v) Water in transparent mold - Flow of water in a transparent mold is a very useful tool. Addition of color marker, oil droplets can help in better visualization and recording velocities in different sections.